For an East Coaster who aspires to greenness, the flight to San Francisco one late summer day was depressingly ungreen. The Boeing 757's lunch box of separately wrapped items produced so much trash, it took both hands to scoop it up. The plane itself, from coast to coast, released 100 tons of carbon dioxide. This city, on the other hand, has the ability to soothe a greeniac's beleaguered senses. Despite being chock-full of the very consumerism that is choking our planet, San Francisco is taking laudable measures to curb its exigencies. It may have a long way to go, but at least it is headed in the right direction. This year alone, the Board of Supervisors prohibited the use of styrofoam containers by local restaurants, and the city last month became the first in the country to ban plastic shopping bags in grocery stores, with drugstores to follow in May. In addition, Mayor Gavin Newsom, a fervent environmentalist, has put an end to city employ ees purchasing bottled water with city money. Most ambitious of all, San Franciscans are endeavoring to reduce their greenhouse gas emissions to 20 percent below 1990's output by as soon as 2012. 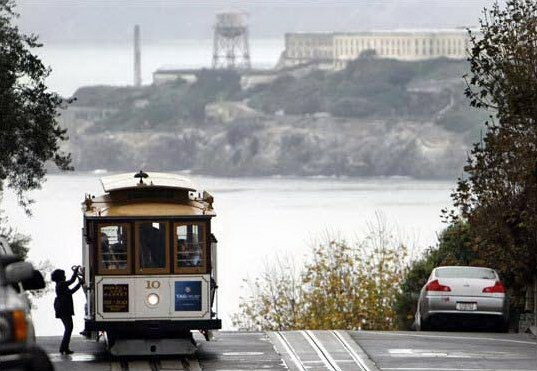 According to Mark Westlund of the city's Department of the Environment, San Francisco has already "rounded the bend," its emissions having fallen to 1990 levels. "But to reach our more ambitious goal," he said, "we need to ramp up the efforts of residents and businesses." He might have included tourists. Greenness can dictate not only where you stay, how you get around, and which restaurants you frequent, but it also can be the impetus behind which corners of the city you choose to explore. For those of us who take this eco stuff seriously, immersing oneself in the many environmental programs and activities the city has to offer can be therapeutic, even hedonistic, as I found out the day I arrived. It happened to be a Spare the Air Day, one of several during the year when public transportation is free, the idea being to encourage people not to drive. The cable cars were jammed, and squeezing aboard one clanging carriage, I got that squishy patriotic feeling as we crested Russian Hill and beheld the crystal-clear view of Alcatraz Island and the sparkling bay spread out below. Here was a city, once so smog-ridden you practically couldn't see your nose, digging in its heels and resisting environmental arrest. A visiting greeniac (a term borrowed from a local green networking group) will, of course, want to stay in as green a hotel as possible. Most every hotel these days plays the green game, whether by offering guests organic teas and coffees or the option to reuse their sheets and towels. However, if you abide by the Green Building Council's LEED (Leadership in Energy and Environmental Design) specifications, there is only one green certified hotel in San Francisco, the Orchard Garden Hotel, which opened last year near Union Square. For a building to be LEED-rated means it has received the sustainability stamp of approval for water savings, energy efficiency, building and interior materials, air quality, and more. The Orchard Garden is only the fourth LEED-certified hotel in the world, the third in this country, and the first of two in California. The other is the Gaia Napa Valley Hotel & Spa. San Francisco has 15 LEED completed projects, mostly commercial, with many others in progress. A handful of hotels, while not LEED-certified, have been approved by the city's Green Business Program. To earn this designation, a business must complete a lengthy, rigorous checklist, said Sushma Dhulipala at the Department of the Environment. Provisions extend to employing water recycling systems, keeping AC condenser coils clean to conserve energy, operating dishwashers only when fully loaded, and hundreds of other criteria. Hotels so far admitted into this small club include the Prescott and Hotel Monaco, both snappy boutique hotels, and the Best Western Tuscan Inn, which offers free parking for guests arriving in hybrid vehicles. On the restaurant scene, the greenest of the green combine the mantra "Buy it fresh, buy it local" with environmentally savvy kitchen and dining-room practices. At atmospheric Jardinière, for example, co-owner and chef Traci Des Jardins strives to fill the menu with items from area farms and ranches known for their sustainable practices. Watercress from Sausalito Springs Farm, chicken from Hoffman Ranch, lettuces from Star Route Farms, heirloom tomatoes from Peach Farm, and sheep's milk from Bellwether Farms are but a few of her sources. At the same time, she and her staff claim to compost and recycle 85 percent of the restaurant's leftovers and other wastes. A meal at Jardinière can be pricey. Then again, Des Jardins received the 2007 James Beard Foundation Award for Best Chef: Pacific for the way her kitchen applies French cooking techniques to local foods, resulting in California French. Moreover, how can a greeniac resist a restaurant where by the end of the year the doggie bags will be compostable and the staff will wear uniforms made from sustainable bamboo? "When you work in a restaurant, at the back of the house, you spend a lot of time dealing with garbage and you become very aware of what that environmental footprint does on a daily basis," said Des Jardins. "As I tell my son, there is no away. Whatever you throw out is always going to go someplace." Something quite wonderful happens to the scraps diners leave behind. Along with compostable leftovers from many other restaurants, they are trucked to a composting facility near Vacaville. Within 90 days they are transformed into nitrogen-rich compost that is sold to many of the farms and vineyards whose products end up back on the table at area restaurants. About half of San Francisco's 3,000 restaurants, along with 120,000 households, contribute roughly 50 tons each day to this massive scraps-to-riches program, the largest of its kind in the country, according to the Department of the Environment. Even the food court vendors at Westfield San Francisco Centre, the city's high-fashion mall, participate by depositing compostable leftovers into a central pick-up location. As for non-compostable trash, San Franciscans reportedly recycle an impressive 69 percent of their recyclables with the city aiming for 85 percent by 2010, 100 percent by 2020. Wines that profit from the composting program - whether an organic pinot gris from Mendocino or a biodynamically grown sauvignon blanc from Napa Valley - are available citywide. The number of strictly green bars, meanwhile, is on the rise. The Yield Wine Bar, which opened last year in the historic Dogpatch section, bills itself as the city's "first and only 'green' wine bar." Elixir in the Mission Dolores district provides a full menu of organic beers, wines, and cocktails, and is certified by the city's Green Business Program. Every second Thursday of the month, Elixir hosts Green Drinks, a networking evening for environmentalists - with transients welcome. San Francisco is proud of its ecological inroads. For insights into the area's food systems, the Center for Urban Education About Sustainable Agriculture, a nonprofit that manages the Ferry Building's farmers market, organizes tours of farms and vineyards and holds frequent "meet the farmer" events and seasonal cooking demonstrations. There are plenty of ways for visitors to learn about the city's changing energy habits and building specifications. Check the websites of the American Institute of Architects/San Francisco (aiasf.org), Organic Architect (organicarchitect.org), and the city's Department of the Environment (sfenvironment.org) to learn about meetings and podcasts devoted to sustainable practices and tours of its greenest buildings. The largest and most provocative is the new San Francisco Federal Building. Its massive window wall of glass and perforated metal sunscreens in combination with sensors on its exterior automatically open and close windows that lend to energy-efficient cooling and heating elements. "Ugliest building in San Francisco," a passerby said as I eyed the 18-floor colossus. It's not exactly ugly, I decided, but intriguingly different, its glassy southeast side covered by a stainless steel skin that helps the building interact with its environment. Most of its workspace is naturally ventilated and lighted by outer light. The city's new home for the California Academy of Sciences - its natural science museum - in Golden Gate Park just might be its crowning green achievement. Although the building is finished, its 410,000-square-foot interior, which will eventually hold a planetarium, aquarium, rain forest, and research facilities, isn't scheduled to open until next October. Until then, the museum's spectacular 2.5-acre living roof - with its 1.7 million plants growing in 50,000 biodegradable coconut husk trays - is viewable from the de Young art museum's tower next door. Spotting green-energy sources as you walk around San Francisco can be a game: 50 points for noticing the new solar panel installed over the Civic Center's parking lot; 1,000 points if you find any of the city's four residential wind-power turbines that sit on roofs looking like eight-foot-high white dairy-creams. (Hint: One is in the city's Bernal Heights neighborhood.) You can follow the city's solar progress on the San Francisco Solar Map (sf.solarmap.org). Click on a dot, each one representing a solar location, and up pops a description of the system installed, estimated electricity produced, and, in some cases, the cost savings. San Francisco would like to have 10,000 solar systems on private and public buildings by 2010, amounting to 60,000 megawatt-hours of sun-produced energy. To date, there are fewer than 1,000, so there's a long way to go. Since San Francisco is a walking city, there's no better way to show your allegiance to green than by packing your sneakers. By using your legs, the streetcars (which are emblazoned with "ZERO EMISSIONS"), the cable cars, and Bay Area Rapid Transit (BART), it's easy to avoid spewing carbon. Three-hour segway tours offered by the San Francisco Electric Tour Co. are another green way to see the city. If you have to use a taxi or bus, the city's fleets are among the nation's leaders in adopting cleaner fuels. Its buses, for example, will run completely on biodiesel by the end of this month, according to Westlund. If you can't do without a car, look into the green programs started by Enterprise, Hertz, and other rental companies and opt for a hybrid. Taking BART to the airport for my flight home took less time than an airport shuttle into the city had taken, cost one-third less ($5.15 vs. $16), and gave me the satisfaction of breaking the fossil-fuel habit at least a little bit.